There is much greatness still ahead for Italy and America. Only a clear, long-term perspective of a new strong economic relationship for the two sides of the Atlantic, one that matches our defense ties, will provide the benefit of credibility and stability. So, why Italy? Among the main Eurozone economies, Italy’s is the third largest, but it is also traditionally closer to the U.S. while economically intertwined to Germany and France. Italy is distinguished by its glorious past – as the spiritual birthplace of Western Civilization. The pillars of our civilization: Roman law, Christianity and the Latinate languages share the genealogy of Italian pedigree. Every Pope except the first few, a German, and one particularly fine Pole have called the country home for most of their lives. Italians themselves have come to define America: Christopher Columbus and Amerigo Vespucci, the cartographer, gave America its name and brought it into the family of European nations. President Washington and the founders of the American Republic, steeped in millennia of cultural output by Roman authors, chose to reestablish that system of government precisely out of deference to the mother ship of civilization. As liberty flourished in the Roman Republic long ago, so has it flourished on American soil. Between 1870 and 1930, the United States absorbed 18 million immigrants, and more than five million of these were Italian. To the established American population, descended from earlier British, Scandinavian and German immigrants, these foreigners were a new breed who looked, dressed, spoke and prayed differently. The Melting Pot of America would surely be rather bland without Italians. Italian immigrants helped to build America—brick by brick—in most of America’s cities. In my own hometown of Philadelphia, all of South Philly was Italian and its contribution to that city was overwhelming, as it was in so many others. In politics, New York City mayors of Italian descent such as Fiorello La Guardia and more recently, America’s Mayor, Rudy Giuliani, served with distinguished records of achievement. In science, Marconi, and in sports, Joe DiMaggio and hundreds more, found their place in the land of the free and the home of the brave. Enter the movies. Francis Ford Coppola’s films sparked America’s love affair with folklore of the Italian Mafia, and with later television programs like, “The Sopranos,” Americans came to peer inside Italian life in America. Like everyone else, they came to America in search of the American Dream and they found it. Even when Italy fell into darkness they managed to impress – Italian navy groups were famously lethal during the Second World War, often outstripping the Royal British Navy, despite not having developed radar technology, which the British had for years. After the war, Italy was one of the few countries versed in the modern governmental planning required by General Marshall and his celebrated Marshall Plan. During Marshall’s tour through Europe as Secretary of State, he traveled to Italy, where one of his aides famously noticed that although the building they were in barely had a roof, the Italians had put a vase full of flowers on the meeting table. Marshall commented that a people who decorated ruins would surely recover swiftly. Within a decade, Italy had indeed recovered from the devastation and was an integral part of the project to reconcile Europeans with each other. It is often forgotten these days that “ever closer union” was a condition of disbursing those Marshall funds, through such giants as Alcide De Gasperi, who had been a member of the Austro-Hungarian Imperial Parliament, defending the interests of Italians his whole life. Shortly after the Treaty of Rome and the North Atlantic Treaty, Italy would be cemented on the side of freedom. The U.S. army would gain some of the first counterinsurgency experience fighting the Italian communist guerrillas of the Brigate Rosse, and the Iron Curtain would run along the border with Slovenia. America is certainly happy to have Italy, such a resourceful and valuable ally, on America’s team. Today over 16 million people in the United States identify themselves as Italian Americans. They constitute nearly six percent of the U.S. population. Italian Americans are the nation’s fourth largest European ancestry group after the Germans, Irish and English. Italian Americans are the only European group whose population has increased since the 1990 census. We can only hope they keep doing so. A recent University of Chicago study of fifteen ethnic groups showed that Italian Americans were among those groups having the lowest percentages of divorce, unemployment, people on welfare and incarcerated. They are among those groups with the highest percentages of two-parent families, elderly family members living at home, and families who eat together on a regular basis. Italy remains the favorite destination of American tourists today, accounting for 12 percent of the Italian economy. Italy has long been a leading security actor in Europe and the world. It hosts the NATO war college and numerous UN bodies, remaining a keystone partner in the war against radical Islamic terrorism. Italy and America are NATO allies and cooperate in missions as varied as fighting Somali pirates, tamping down on refugee smuggling operations and providing security in the Mediterranean. Under long standing bilateral agreements flowing from NATO membership, Italy hosts critically important U.S. military forces at Vicenza and Livorno (Army); the Aviano Air Force base; and Sigonella, Gaeta, and Naples — home port for the US Navy Sixth Fleet. The United States has about 15,000 military personnel stationed in Italy, and it is easy to envy their posts in such a fine country. Italy remains a strong and active transatlantic partner who, along with the United States, has sought to foster democratic ideals and international cooperation in areas of strife and civil conflict. Italy is a dear partner for America and America is, because of the ties mentioned, Italy’s most critical ally. 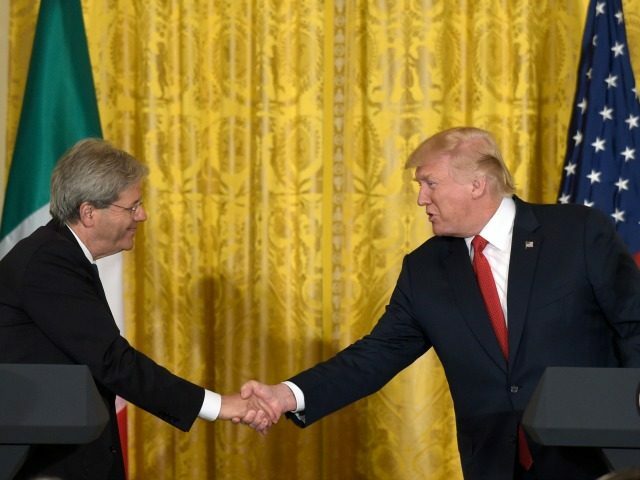 Italy and America are joined at the hip and it shouldn’t be any other way.